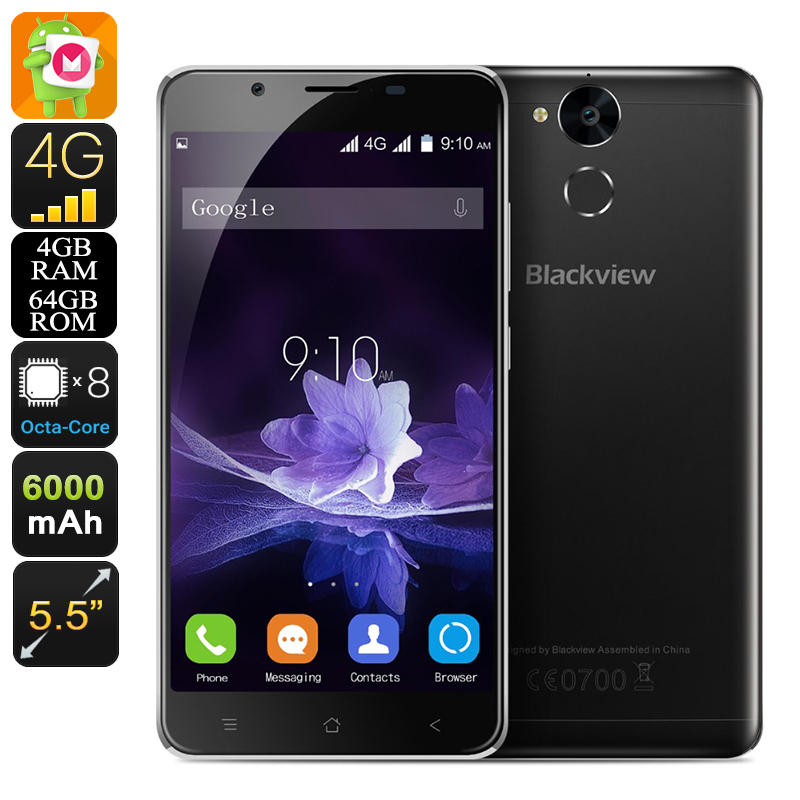 Successfully Added HK Warehouse Blackview P2 Android Smartphone - Octa Core CPU, 4GB RAM, 5.5 Inch FHD Display, 4G, 6000mAh (Black) to your Shopping Cart. The Blackview P2 is has a remarkable list of specs including a fingerprint scanner, 5.5 inch full HD screen, powerful octa-core CPU, 4G connectivity and a 6000mAh battery that will keep all this running for hours on end. It is clear that this attractive new entry from Blackview is going to attract a lot of attention, especially given its low price tag. The 5.5 inch full HD display brings a marvelous visual experience as it crams in a whopping 400ppi for vivid details that pop from the screen. Its deign boasts a 75% screen to body ratio so despite its large viewing area the phone remains very slim and compact. Covered in a 2.5D curved glass and sporting a full metal body design, crafted from aircraft grade aluminum alloy offers a perfect combination of glass and metal that is great to look at and sits comfortably in your hand. Under the hood is an Octa Core MR67540T chipset p[aired with 4GB of RAM for a stunning performance. This new style processor is extremely efficient and consists of 4 cores running at 1.5 GHz and 4 cores clocked at 1.0 GHz. This combination of low powered processor cores coupled with fast high powered cores allows the chip to handle intensive gaming and computational tasks while also reducing power consumption for less intensive tasks. The result is an extremely capable CPU with less power consumption which will drastically extend usage time. This is coupled with a Mali-T860 MP@ 650MHz graphics processor for accelerated graphics rendering that will deliver a super performance for games and movies. The P2 smartphone has an Android 6.0 operating system for a smooth user experience and packs a 6000mAh battery, With OTG support this can be used to recharge other devices allowing the phone to operate as a power bank. With such a phone at your disposal, you'll never be short of power again as it has enough juice to meet the most demanding tasks. The Blackview P2 Android Smartphone comes with 12 months warranty, brought to you by the leader in electronic devices as well as wholesale Phones and phablets..